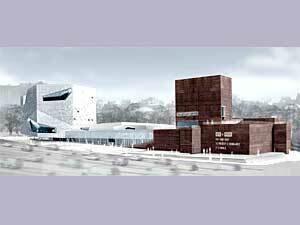 The Walker Art Center in Minneapolis has long been known as the center of contemporary art in the Midwest. A newly expanded and renovated Walker opens its doors to the public Friday. The new building not only adds space for more artwork, but it marks the beginning of a new era for the institution. Minneapolis, Minn. — Walker Director Kathy Holbreich likes to stress the word "center" in Walker Art Center. She says the Walker is more than a museum, and she wants its new expanded home to reflect that. "We really wanted to create an environment for all the art forms -- performing, visual, and media arts," says Holbreich. "But we also wanted to create an environment that allowed people to come to new ideas, new values, in a way that was accessible and comfortable." Holbreich says art in the 21st century is going to be about collaboration and new hybrid forms -- dancers incorporating film; musicians using dance. She wanted a space that would allow artists and audiences to break down old barriers and intermingle. The result is a building very different from the Walker's old home. The previous building, designed by Edward Larrabee Barnes, was a minimalist monument to the early 1970s. It's basically a large brick box. The new building, designed by the Swiss architectural team of Jacques Herzog and Pierre De Meuron, is inspired by the image of an unfolding paper snowflake. Many walls and doors are at odd angles. Numerous windows look out onto Hennepin Ave., the sculpture garden and neighboring churches. Brick floors mimic city streets and lead visitors down narrow passageways into large vaulted atriums. "There are chandeliers in this building, there are couches in this building, there are domestic spaces in this building," says Holbreich. "And there were times that we knew that we were in an institutional space that we had never seen before. And the question was, do we let it rip, or do we restrain it? I think in the long run we decided to let it rip." The $70 million final price tag for the addition is about $2.5 million more than the museum's board had planned for the project. Those numbers don't phase Holbreich, who says over budget or not, the new building is a bargain when you consider its size. The expansion provides the Walker with a new restaurant and a black box theater. It also adds 10,000 square feet of gallery space. This thrills chief curator Richard Flood. The Walker's art collection has increased by 40 percent in just the past decade. He says his team got a bit overexcited when they moved the paintings and sculptures back out of storage. "We're able to show the work that we have better than we ever have before, because we have more room," says Flood. "We brought out far too much material to actually be able to install. So we ended up with not as much material from the collection out, but the material that's out you can see in a much more gracious way." You can also explore the work in entirely new ways. Robin Dowden, director of new media initiatives, holds her hand over a flat computerized table in a hallway. On the screen several small people appear, as do some of the Walker's more notable works of art. Robin grabs a sculpture in this virtual world and drags it to one of the people. A dialogue box opens to explain more about the piece. The computer uses gaming technology to allow visitors to explore the collection. Across the hall, visitors sit at a monitor and peruse the Walker's film archives. Around the corner they can type questions in a keyboard and get responses from a talking dolphin. These are fun tools in a beautiful building, but can they make the Walker Art Center more of a "center?" Director Kathy Holbreich says she thinks they already have. "Two teenagers were here representing their school newspaper, and when they told me they wanted to have their high school prom here, I knew we had succeeded," says Holbreich. The Walker Art Center opens to the public with an all-day celebration including performances by Philip Glass, Meredith Monk and the New Humans.